Roche was founded in 1147, the Golden year of Cistercian expansion, but a time of civil strife in England. The foundation was a joint venture by Richard de Busli, lord of Maltby, and Richard FitzTurgis, lord of Hooten, whose lands were divided by a small brook. De Busli was lord of Tickhill Castle and held most of the manor of Maltby. Monks from Newminster Abbey in Northumberland, were sent to colonise the house. 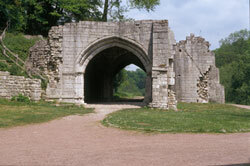 Newminster was the daughter-house of Fountains Abbey, and Roche was thus affiliated to Fountains and joined to the Clairvaux line. Richard de Busli and Richard FitzTurgis provided land, pasture and wood for building. The monks next task was one of consolidation  they had to develop the site to provide for a self-sufficient community, and secure additional gifts to support their work and expansion.